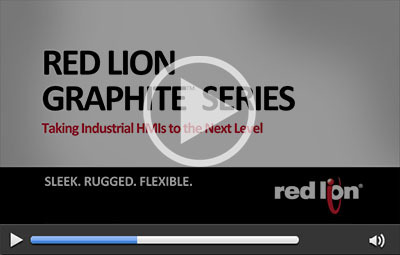 Red Lion’s Graphite® platform is comprised of the industry’s first rugged HMIs and controllers to combine I/O modules with protocol conversion, data logging, web-based monitoring and IEC 61131 control capabilities. Built for extreme environments, Graphite HMIs and controllers feature cast-aluminum housing and CE, UL/cUL and UL/cUL Hazardous approvals that support a wide operating temperature range and high shock/vibration tolerances common to industrial applications. Sleek Design and Innovative Technology – Ideal for indoor and harsh outdoor environments, Graphite HMIs are available in eight different sizes ranging from 7 to 15 inch and feature sleek full-color touchscreens in a streamlined footprint for easy installation. With all-metal construction, a built-in web server, and wide operating temperature range, the Graphite Edge Controller combines IEC 61131 control capabilities with networking, protocol conversion and data visualization for a rugged all-in-one solution to meet complex application needs . Rugged Case for Extreme Conditions – Cast-aluminum, all-metal construction means Graphite HMIs and controllers are well suited for oil fields, wastewater plants or other industrial locations. Built to operate in extreme conditions, Graphite HMIs and controllers support wide temperatures and high shock/vibration tolerances that enable organizations to connect, monitor and control processes regardless of environment. Rugged expansion racks and HMI model-specific outdoor sunlight visible displays available. Flexible Modules and Expansion Options – A wide variety of Graphite plug-in modules and expansion racks seamlessly extend capabilities while minimizing development times over traditional systems that use HMIs or controllers paired with separate I/O, PLCs and other devices. Quickly create a solution today that not only addresses varying requirements, but also easily scales to satisfy future business requirements. Built-in Protocol Conversion – With a few clicks of the mouse, Graphite HMIs and controllers convert numerous industrial protocols simultaneously from a built-in library of over 300 supported drivers to unify disparate devices such as PLCs, drives, cameras, barcode readers and panel meters. Seamlessly exchange data between all connected devices to manage multi-vendor environments with ease. Real-Time Data Logging – Graphite HMIs and controllers log real-time performance data, including productivity and output comparisons, to enhance troubleshooting, pinpoint bottlenecks and help meet regulatory requirements. Remote Monitoring – A robust web server provides remote access and control to reduce costly site visits. Simply monitor applications via PCs, tablets or smartphones and automatically receive SMS text-messaging and email alerts to proactively manage operations. Powerful Crimson® 3.0 Software with Crimson Control – Intuitive drag-and-drop graphical software provides easy setup and offers single-solution configuration that eliminates the need for third-party software. Graphite controllers and HMI Crimson Control module enable the use of industry-standard IEC 61131 programming languages such as Ladder Logic, Function Block, Structured Text and Instruction List to develop logic code without added expense.